Companies love Pseudoscience. They feed off the money they yield from the various products that claim to give ordinary human beings, everyday "superhero" powers or feelings. Most of these products love to make claims such as well being, positive energy, and even pain relief. With most of the products making these claims targeted towards adults, what products could use this same formula to have children contribute to the companies money feast? In my eyes, I see mood rings as a pseudo-scientific way for companies to have children help contribute to their wealth. 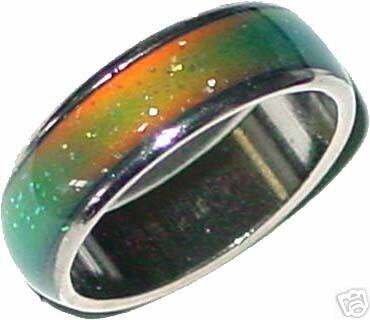 Mood rings are fashionable rings that changes a variety of colors making it very appealing to children. According to what color your Mood Ring changes to, correlates with what kind of mood you are feeling. Here is a map of the colors and their meanings. "The crystals were calibrated with have a pleasing blue or green color at the average person's normal resting peripheral temperature of 82°F (28°C). As peripheral body temperature increases, which it does in response to passion and happiness, the crystals twist to reflect blue. When you are excited or stressed, blood flow is directed away from the skin and more toward the internal organs, cooling the fingers, causing the crystals to twist the other direction, to reflect more yellow. In cold weather, or if the ring was damaged, the stone would be dark gray or black and unresponsive." Mood rings are a nice little souvenir for kids to bring home from a vacation, yet just like the many products that use Pseudoscience to sell, it is misleading with its claims. Thankfully these claims are for a fun product and not one that people will depend their life around.